December 3, 1969. The rocks disappeared in 1973 during a museum fire. 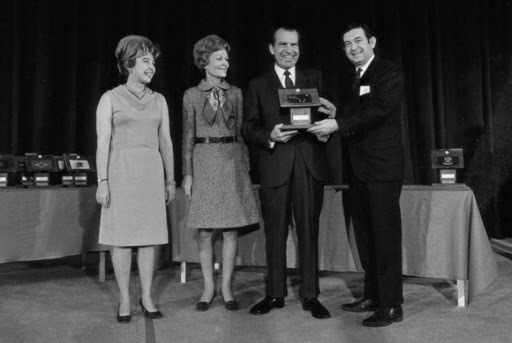 In 1969, President Richard Nixon presented moon rocks to the state of Alaska. The rocks were gathered by the Neil Armstrong and Buzz Aldrin during the Apollo 11 mission. Similar stones were awarded to states around the country. Following an arson fire at the Alaska Transportation Museum in 1973 the stones disappeared. Fast forward to 2010 when Coleman Anderson, star from the hit reality show “Deadliest Catch,” claimed ownership of the rocks. He sued Alaska for clear title, but consented to sell the stones back to the state. Anderson, stepson to the Museum’s curator, claims that he found the rocks in the fire rubble and took them home for safe keeping. (They are conflicting reports that Anderson’s step-father, Phil Redden, actually removed the rocks from the fire debris). Government officials questioned the validity of Anderson’s story and countersued for possession. Assistant Attorney General Neil Slotnick jokingly acknowledged: “Many times I feel that plaintiffs are asking for the moon. This is the first time that that was literally true.” Using photographic evidence and witness accounts the state built a strong case against Anderson. The moon rocks have now returned to the Alaska State Museum and will be on display through December. They will be exhibited around the state during the next year. Sources: The Washington Post, Art Daily, image from Art Daily.